Gohr of Stage5 Cycling won the Nancy Morgenstern Bowl and Jeff Buckles from Richmond Pro Cycling won the Pro/1/2/3. Because of a conflict with the NYRR Marathon TuneUp the CRCA club race scheduled for Sept 19 has been rescheduled for Sept 25. 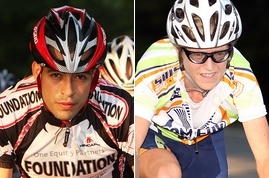 AXA, nyvelocity and Houlihan-Lokey clinched the team titles in today’s Team Cup Finale. Sauvayre and Epstein are Club Champs! 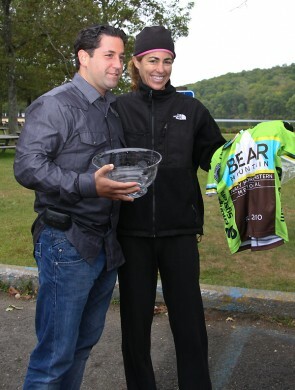 Sarah Sauvayre, Comedy Central and Gavi Epstein, Foundation are the CRCA 2010 Club Champions. The Team Cup Finale with double points is this Saturday, Sept. 11. AXA leads the A Cup, with Houlihan Lokey dominating the women’s field. Three teams, nyvelocity,Houlihan-Lokey and Foundation are closely contesting the B Challenge.